This section should provide a good background of information for organising your own trek in the Andes and the information in general will help plan any adventure trip to South America. There are fees payable for various treks, especially those in national parks or other protected areas such as the Inca Trail to Machu Picchu and the Torres del Paine circuit. With the exception of the Inca Trail to Machu Picchu, the fees are never very high, usually only $10-$20 per person and the money is used for upkeep of these heavily used areas. The Inca Trail now costs at least $500 per person and because of its popularity it needs to be booked well over three months in advance. There are several excellent guide books for trekking and/or climbing in the Andes, as indicated in the fact files at the end of each country page. 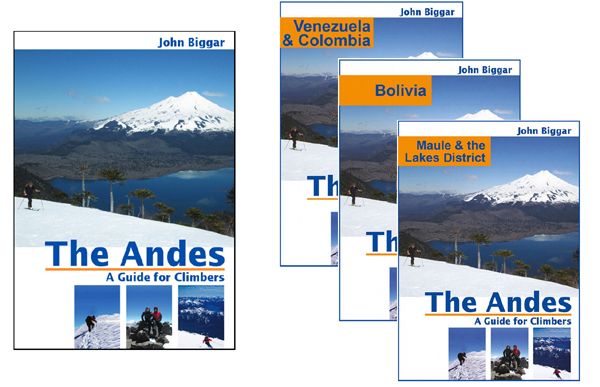 At "Andes" we publish and sell climbing guides to the Andes (guidebooks). Rough Guides and Footprint also publish good general travel guides full of information about hotels and travel in each of the countries featured on this website. There are very few good maps of the Andes available abroad, the main exceptions are some of the most popular areas in Argentina including Aconcagua and Patagonia and parts of Chile and Peru. Alpenverein of Germany and Austria publish a few excellent sheets for the Cordillera Blanca, Cordillera Huayhuash and Cordillera Real. Ironically they also have a dangerously inaccurate sheet for Ojos del Salado. In the UK it's worth trying The Map Shop (01684 593146) or Stanford's (020 7836 1321) to obtain these and other larger scale maps. Either shop may also have a few South American IGM or other high scale maps in stock if you're lucky! Official IGM survey maps can normally only be bought from the Government Mapping Office (Instituto Geographical Militar - IGM in Spanish), and normally only in the capital city. Maps of remote areas may not have been printed and maps of border areas may be unavailable for military reasons. Maps at 1:50,000 can be obtained in Bolivia, Chile and Ecuador and at 1:100,000 for much of Peru and Argentina. Although not as good as the Swiss or British OS these maps are basically reliable for topographic information - watch out for 50m or even 100m contour intervals though! Information about roads, paths, tracks and settlements is often very out of date and should not be relied on at all. Many names are also different to those used locally. There is little organised mountain rescue in South America and on most of the treks it is extremely unlikely that you will be rescued. Trekkers should therefore be self sufficient and able to effect their own rescue, probably using mules or donkeys they have with them. In a few areas where mountaineering is better developed e.g. Cordillera Blanca, Cordillera Real, Ecuador, there is an informal system in place where the local 'guides' will assist anyone in trouble, but this is likely to take several days at least. It is a very good idea to carry a first aid kit with some additional medicines and equipment for use in remote areas. Pack animals can be hired to assist with equipment in most areas. These can be donkeys, mules, horses or even llamas in Peru and Bolivia. Donkeys can each carry 40kg, mules and horses up to 60kg, llamas as little as 25kg. Prices are extremely variable but in Peru and Bolivia animals can cost only $20-$25 per day. In Chile and Argentina pack animals are much more expensive, costing from $50-$80 per animal per day. They can also be much more difficult to find, except in well known high use areas (e.g. Aconcagua). Pack animals will always come with an arriero (horseman) to look after them and you'll have to pay his wages and perhaps give him food and shelter too. You will have to negotiate with your 'arriero' and it's a good idea to get at least a basic written contract and pay only 50% or so in advance if possible. Porters are available in only a few parts of the Andes, their job normally being done by pack animals. However on the Inca Trail to Machu Picchu they are all that is available because donkeys can't go up and down the steep steps or through the tunnels. Rates are about $30 per man per day in Peru and Bolivia, as much as $150-$250 per day on Aconcagua and in Argentine Patagonia. Do not use young children as porters. There are mountain guides available in a few of the main mountaineering centres in South America and they can be a lot of help if you want to climb one of the easy peaks. They can also be well worth hiring for a trek because they have very good knowledge of the local mountains and conditions, are good at organising arrieros, porters etc. and will be very fit at altitude. A guide will cost about $100-$150 per day, depending on the country, the difficulty of the peak and the size of the trekking or climbing group. In most areas clothing suitable for a summer trip to the higher areas of the European Alps or spring and autumn walks in the British hills will be suitable for trekking at up to 4500m. It can feel extremely hot in the valleys in the afternoon sunshine, but overnight in Peru and Bolivia it gets very cold. A modern flexible clothing system should be used. Essential items for all treks are several fleece layers and a complete wind and waterproof shell, also a warm hat and gloves. You'll need a comfortable pair of boots and rucksack. It's far better to take ones that you are already comfortable with rather than suffer uncomfortable new equipment on your holiday of a lifetime. Most trails in the high mountains are very dry so a pair of lightweight goretex or leather boots are ideal. In Patagonia it will be a bit wetter and a more solid pair of boots and perhaps a pair of gaiters will be useful. Very low temperatures (-10ºC) at night mean a 4 season sleeping bag is more or less essential for camps above 4000m in Peru and Bolivia. In Patagonia the weather is much milder and camps are usually at low altitude, so a 3 season sleeping bag will do. You'll obviously want a comfortable lightweight camping mattress too. With long hours of darkness in most of the Andes don't forget to pack a torch and a few good books. Few treks pass through areas where there are mountain huts, so trekking in the Andes inevitably involves camping. If you are joining an organised trek this will all be provided, but if you're going on your own the following advice may be useful. Tents need to be lightweight (particularly if you're backpacking) and strong to survive the occasional minor storms or snowfalls. There are many such tents available these days from companies such as Terra Nova, Mountain Hardwear and North Face. Stoves should be light and robust and fuel efficient. Stoves such as the MSR which are able to burn almost any petroleum product are the most adaptable. They work best with bencina blanca (white gas, solvente) which is not always readily available, but can also be used with ordinary vehicle petrol/gas which is always available. Butane/Propane gas stoves are more convenient to use if you know that you can buy the correct fitting cylinders at your destination, usually no problem in popular destinations like Cuzco, Huaraz and much of Patagonia. At altitude a cigarette lighter may be easier to use than matches - flames don't burn well without oxygen! Most towns have a reasonably good supermarket somewhere. The quality and variety of food in shops is very good in Brazil, Colombia and Chile. Supermarkets are less good in Peru, Ecuador, Argentina, Venezuela and Bolivia, except in the very biggest cities. Useful camping food always available in South America includes :- bread, flour, sugar, dried milk (not Venezuela), tea and coffee, packet soups, cereals & granols, porridge oats, dried potato mix and pasta. Also available are chocolate bars and biscuits (not cheap), boiled sweets, powdered fruit drinks. Items not usually available include :- freeze dried food, dehydrated meals, good quality dried fruit and nuts, instant puddings. In some of the more popular areas such as Huaraz, Cuzco and La Paz, cooks can be employed for your trek. They will provide a stove and also buy most of the food, not to mention doing all the cooking and washing up! There is some equipment for purchase and rental in major centres like Huaraz, Cuzco and La Paz. You should avoid having to use it if you can because the choice is usually very limited and camping equipment is often old and shabby. If you are planning just a day or two of rafting or biking along with your trekking holiday then there is really no choice but to hire the equipment necessary once in the Andes. If you organise this through a local tour operator you should get fairly good gear, but in any case you should view or even try out the equipment the day before using it in earnest. Make sure you get a bike with good brakes and a reasonably comfortable saddle.